So: music and food, in particular Japanese-inflected Western food. 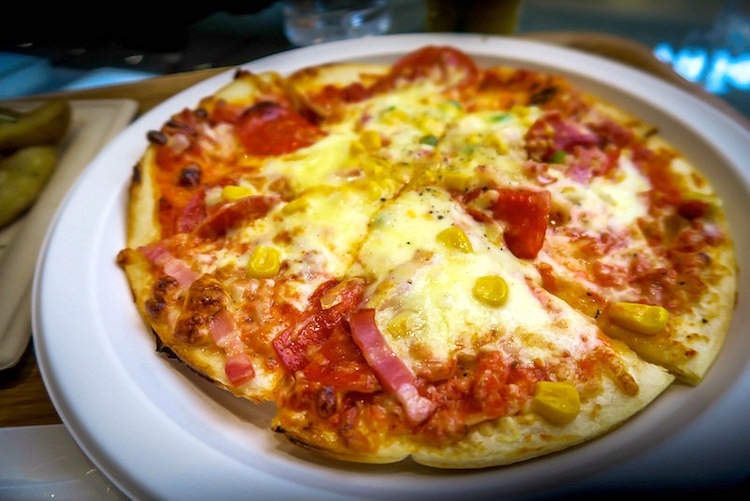 After you go past the major fine restaurants at Narita Airport, as you continue to walk towards your connecting international flight, you’ll find several restaurants that are inexpensive. One of them is FaSoLa Cafe Coffee & Beer near the connection of the main and satellite buildings in Terminal 2. The area offers a great view of numerous aircraft and the interior is a great place to eat and relax. FaSoLa is the largest duty free retailer at Narita Airport. The company started in 2014 and started with 10 existing stores and now they have 80 shops including seven new stores which opened in Terminal 3 in 2015. You can grab water, soda, coffee, beer, whiskey, cocktails and a wide selection of meals. After a lot of waiting at Narita Airport and waiting to get into Terminal 2, finding FaSoLa Cafe was quite pleasant because I could use up all the yen coins I still had with me. And needed to use them up, as I didn’t want to carry that many coins with me back to the U.S. I ended up ordering a pizza and like all Japanese pizza I have eaten in Japan, you’ll often find corn on it. And I ordered a side of garlic potatoes, which were delicious. 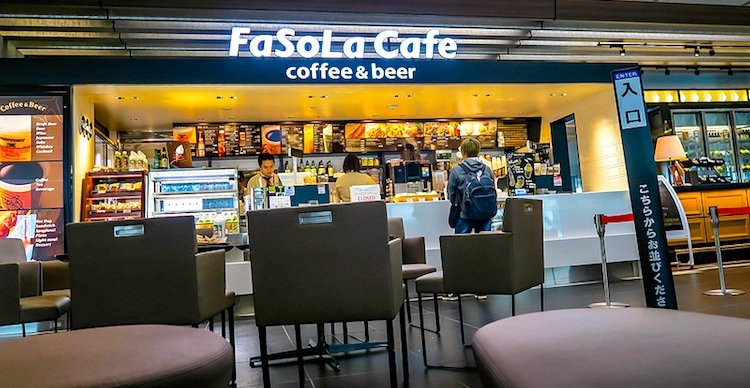 … If you are wanting inexpensive comfort western food with a Japanese twist, give FaSoLa Cafe Coffee & Beer at Narita Airport a try! The company’s website (linked to above) has lots of information, but nothing about why they chose the name they did. Maybe it just struck them as characteristically “Western”. This entry was posted on August 22, 2017 at 9:48 am and is filed under Language and food, Music, Names. You can follow any responses to this entry through the RSS 2.0 feed. You can leave a response, or trackback from your own site.